The EdBlogs service supports one blog for every course. Currently the service does not provide individual blogs for students. 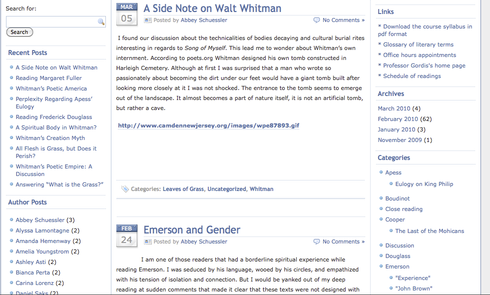 The “Authors Posts” widget allows one course blog to be searched for posts by individual author, providing the next best thing to an individual blog for each user (please see screen shot below). Students that need an individual blog may set up a free blog through services like Blogger , Wordpress , and Columbia Blogs. Your department learning designer can help you strategize the management of multiple blogs for your learning objectives.